Doonesbury Goes to War, Part IV: Phred, B.D. and the Heartless Air Pirates. Last time out, I began writing about how Garry Trudeau addressed the immediate aftermath of the Vietnam war, looking at the experience of Kim and other refugees from Vietnam and Cambodia. The second part of that series is going to look at the ways in which two soldiers, Phred and B.D., adjusted to post-war world; the third is going to look at American foreign and military policy in the immediate post-Vietnam era. But as I started to write that second post, sketching out some ideas about Phred’s post-war career as a re-education officer in a united, communist Vietnam, I realized that there were important parts of his story that I hadn’t looked at, and that I needed to finish telling the story of his war, and the story of the war more generally, before moving on. Upon assuming office in 1969, Richard Nixon began implementing a policy known as “Vietnamization,” which involved cutting the number of American soldiers in Vietnam while building up South Vietnam’s ability to attain its military objectives. By 1972 – the year when B.D. served – the United States had withdrawn some 400,000 troops from Vietnam. As America pulled back from its commitment to fighting in Vietnam, Garry Trudeau shifted much of his attention away from the experiences of American soldiers to provide a running commentary on the war through the eyes of those who suffered the most during the conflict: the people of south-east Asia. His principal Vietnamese character, Phred the Viet Cong terrorist, was transformed from a sidekick to a spokesperson for a region that, even as the American presence was starting to shrink, was still suffering under massive aerial bombardment (in Vietnam, Laos and Cambodia) in order to advance American foreign policy objectives. GBT’s strips about the bombings marked a second major shift in how he covered the war in southeast Asia. When he started writing about the war, Trudeau used dark satire to underline the brutal nature of American militarism. When B.D. arrived in Vietnam, dark satire gave way to goofy humour that took a softer approach dealing with violence. The arrival of Phred showed readers that, despite the fundamentally dehumanizing nature of much of American discourse about the Vietnamese people (…a set of ideas that made war crimes such as the My Lai massacre possible) they were actually human beings with the full range of human emotions. And mothers. Starting in October 1972, GBT stopped pulling his punches about the suffering caused by American aggression in south-east Asia. The Sunday, 29 October strip finds Phred in the jungle, writing to B.D. Using language that rarely appeared in the funny pages, Phred describes the “horror and agony of war”: “bombs rain daily” and his parents have again become refugees because his “hamlet was levelled.” While the strip ends on an uplifting note – Phred’s love of rock and roll helps “chase them naughty blues away” – it is fundamentally disturbing when compared to GBT’s previous Vietnam material. Death is no longer an abstraction: a familiar character is confronting it in a way that is much more real than we had previously seen. No softening, and no satirical exaggeration: people who, like us, love Elvis Presley records, are dying, and their homes are being destroyed. Trudeau sometimes couched his increasingly pointed critiques of American actions n humour that played on the personalities of his characters. After Phred writes that letter to B.D., Boopsie interrupts B.D.’s huddle with the news that casualties from a recent American rocket attack on North Vietnam included cows, sheep, chickens and, worst of all, baby ducks. The punch-line is in Boopsie and Zonker’s reactions; two usually apolitical characters are shocked into understanding how horrible the war is because of some dead birds. A few days after this interlude, however, GBT gets real again. Zonker wants to talk with B.D. about how America has been bombing “schools and hospitals and defenceless hamlets.” Again, Trudeau is determined to use his voice to expose, in frank, clear, unambiguous language that was unique among syndicated comic strips, the horrors that were being done in the name of the American people. Shortly after the “baby ducks” strip, B.D. headed back to Vietnam – this time, not as a soldier, but as a tourist. His return visit allowed Trudeau to confront his readers with the helpless rage that the Vietnamese people must have felt as the American war dragged on with no end in sight. Foreshadowing Donald Trump’s vision of another communist Asian nation becoming a hot tourist destination, Phred invited B.D. to come see Vietnam before it was “spoiled” by the “tourists, resorts and hotels” that would come with the “impending threat of peace.” In fact, this was as much a planned exercise in consciousness-raising as it was a reunion of two war buddies. Admittedly, the story of B.D.’s Vietnamese vacation was marked by the the goofy buddy humour that dominated his stint as a GI, much of which deliberately minimized the horror of the war: Phred admits to blowing up a man’s bicycle because he supported the Thieu regime, and he rejoices at finding his old desk in the bombed-out wreckage of his former school. We also get the incongruous images of B.D. and Phred getting drunk and singing Christmas carols and enjoying a gourmet meal in the middle of a war zone. But these moments of lightness stand in sharp contrast to what we learn about the horrors of the war as it was experienced by Phred and his people. Phred takes B.D. to visit his mother at a refugee camp; there is “destitution as far as the eye can see.” A few days later, B.D. and Phred get caught in an artillery attack. When B.D. suggests they help a wounded man, Phred lashes out, screaming that the man is “just ONE of the millions of civilians who have been wounded or killed” since the war began, a statistic that’s repeated in a strip that ran a week later. Trudeau wanted his readers to understand just how tragic the war was for the Vietnamese people. He also wanted them to understand something about the logic that drove their suffering. As B.D.’s trip was winding down, Trudeau introduced two characters who, although they never directly interacted with Phred, represented the power that was systematically destroying his people’s lives and livelihoods. After an American airstrike forces B.D. and Phred to take shelter, Phred impotently screams his rage at the “heartless air pirates” who dropped the bombs: “I hope you can live with all the destruction and carnage you’ve brought to my little country! !” Meanwhile, the Heartless Air Pirates, several thousand feet above, are insulated from, and seemingly oblivious to, what is happening below them. The appearance of the Heartless Air Pirates made GBT’s writing about Vietnam even more surrealist. War is a fundamentally insane endeavour, and the only way for the people tasked with executing it is to embrace the cognitive dissonance that defines existence in a war zone. Trudeau had already hinted at the insanity of the logic of American bombing in two throwaway panels earlier in 1972. Zonker reads that the Pentagon planned to drop 50,000,000 tons of bombs on Vietnam. The only rationale provided for this radical act of violence came from an official who justified it by reminding Americans that the lives of Vietnamese people were of exactly zero consequence: “Well, why not? You know? I mean, what the heck.” The Heartless Air Pirates allowed Trudeau articulate the gap between that bizarre logic and the ability of the people who had to operate within it to maintain their sanity. For America, the Vietnamese people were human beings of a lesser order, and their lives were secondary to strategic and geopolitical priorities: “In order to save the village, we had to destroy it.” The only way for the perpetrators to live within that logic is to do whatever they can to insulate themselves from it; but that’s only a stopgap measure. The inherent contradictions ultimately reinforce the systemic insanity. This was a key theme in 1960s and 1970s anti-war culture, as seen in popular novels and films like Catch-22 and M*A*S*H. Like Milo Minderbinder and Hawkeye Pierce, the Heartless Air Pirates know they are living with insanity, but as they attempt to make peace with that insanity, its depths are made all the more apparent because the contradiction is just too big. High above the carnage they cause, the Heartless Air Pirates have a perspective on the war that in no way reflects the reality below. One of them is touched by a recent gift he received: a copy of Jonathan Livingston Seagull. Two ideas about flight that were central to the culture of the era – the well-meaning, if somewhat empty-headed hippie idealism of Richard Bach’s poetic novel and a B-52 dropping tons of ordinance on peaceful villagers – are forced into the same frame, revealing the insanity of the times in sharp contrast. In their last appearance, the Heartless Air Pirates take “one last spin over the Delta,” because “it’s a beautiful day” to look at “some kinda country.” How that country looks, of course, depends on where you look at it from. The Heartless Air Pirates watch in awe as the bombs they drop “[catch] the sunlight as they [disappear] into the clouds,” leading something akin to a Fourth of July celebration; however, as one of them notes, things probably “looked different from the other end.” Phred’s impotent rage at the Heartless Air Pirates gives us a hint at how things looked from the other end. I have yet to find another widely-syndicated newspaper comic strip that did so much to force American readers to reckon with the human costs of what their government was doing in their name. B.D., however, was not ready to reckon with what his country had done to the Vietnamese people; in the months following his Vietnamese vacation, he continued to wholeheartedly support the American war. The beginning of his reckoning with Vietnam would start when the last helicopters brought the last Americans off of the roof of the American embassy in Saigon, and the process would take decades; it’s still unfolding. Stay tuned. 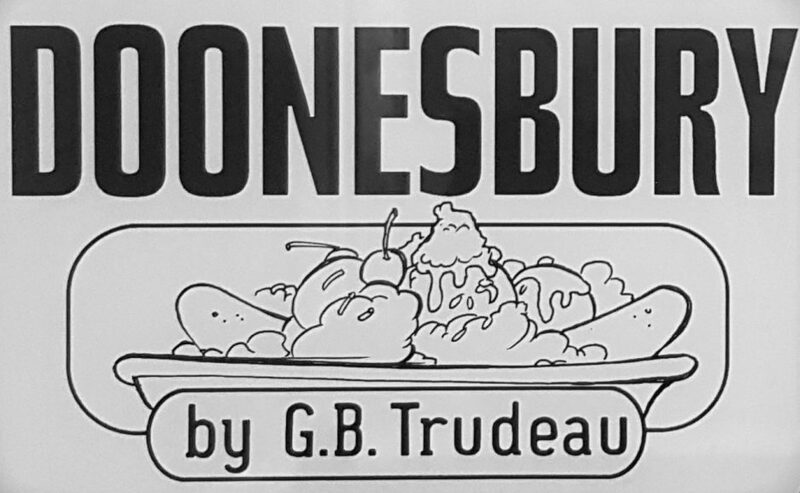 Next ›Doonesbury Goes to War, Part V: Traded to Laos.